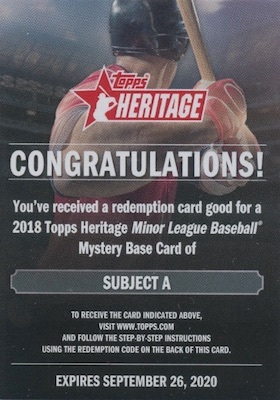 No, this is not Series 3 of Heritage, it's 2018 Topps Heritage Minor League Baseball! 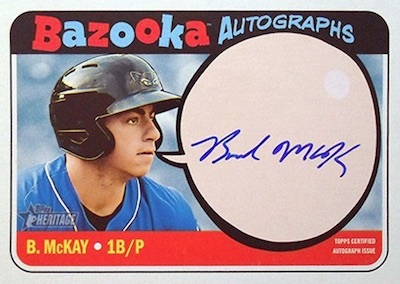 The Hobby-only set covers some of the top MiLB names hoping to make the jump to MLB stardom. 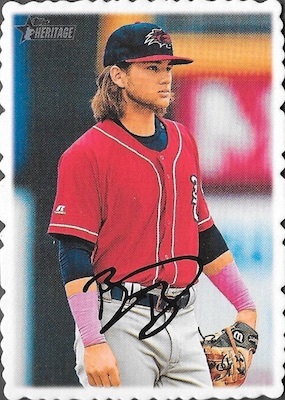 Although matching many of the designs found in 2018 Heritage and Heritage High Number, 2018 Topps Heritage Minor League Baseball switches the focus to the up-and-coming prospects. Each box contains one autograph and one relic. 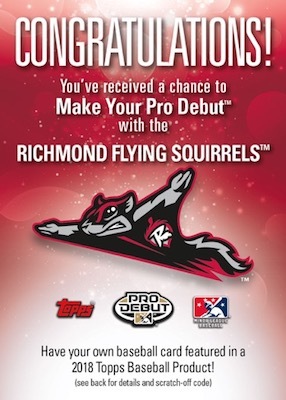 There are also two chances per box to win the Make Your Pro Debut promotion that awards a collector a one-day contract with the Richmond Flying Squirrels, and a card in 2019 Topps Pro Debut Baseball. Like the other Heritage releases in 2018, the 200-card base set in 2018 Heritage MiLB honors the 1969 Topps design. This includes League Leaders and The Topps News Minor League All-Stars subsets. Low-numbered parallels consist of Blue Border (#/99), Black Border (#/50), Team Name Color Change (#/25) and Red Border (1/1). In addition, there are Gloss Front parallels found in the three-card Blue Cello Pack box toppers. Each box has one topper pack. 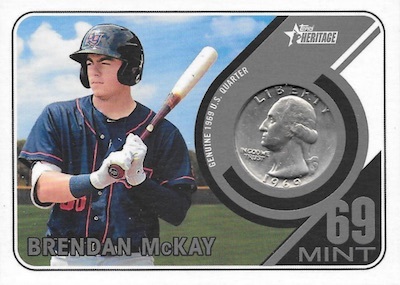 Giving set collectors a little more of a challenge, the 2018 Topps Heritage Minor League Baseball checklist even offers base Short Prints and Image Variations. Maintaining the '69 style, 2018 Topps Heritage Minor League Baseball also features 1969 Collector Cards and die-cut 1969 Topps Deckle Edge inserts. Displaying on-card signatures, the 2018 Topps Heritage Minor League Baseball autographs fall one per box. The main choice is the Real One Autographs line with Blue Border (#/99), Black Border (#/50), Team Name Color Change (#/25) and Red Border (1/1) parallels. Additional signed choices include all-new base Image Variation Autographs (#/50), Bazooka Autographs (#/50) and Dual Autographs (#/20). Numbered to 99 copies, the 1969 Topps Deckle Edge Autographs set is issued in the primary black-and-white version and in a Color Image parallel that has just 25 copies. Similarly, memorabilia cards come one per box in 2018 Topps Heritage Minor League Baseball. The Clubhouse Collection relics contain game-used pieces with limited Blue (#/99), Black (#/50), Orange Patch (#/25) and Red Patch (1/1) parallels. Featuring an embedded coin from 1969, the '69 Mint insert also works with Black Quarter (#/50), Red Quarter (1/1) and Auto Relic (#/10) editions. PARALLEL CARDS: Glossy (Cello Box Topper), Blue #/99 (1:20), Magenta Backs (1:40), Black #/50 (1:40), Team Color Change #/25 (1:80), Red 1/1. 20 cards. Noted as "Short Print" on the back of the card. 10 cards. Image variations are noted as "Image Var." on the back. CMP code ends #482. 10 cards. Circle color variations noted as "Color Var." on the back. CMP code ends #483. 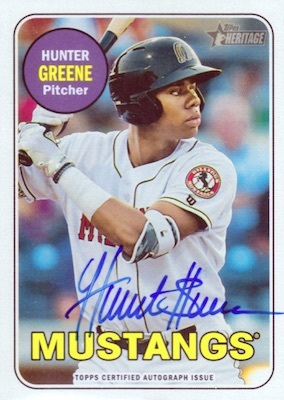 Buy 2018 Heritage Minors autographs on eBay. PARALLEL CARDS: Blue #/99, Black #/50, Team Color Change #/25, Red 1/1. PARALLEL CARDS: Color Image #/25. PARALLEL CARDS: Blue #/99, Black #/50, Orange Patch #/25, Red Patch 1/1. PARALLEL CARDS: Black Quarter #/50, Red Quarter 1/1. 30 cards. The cards feature a facsimile signature. PARALLEL CARDS: Color Image (Limited). I love these cards, and as always, I’ll buy a few boxes! My only complaint is how they’re always released after the Minor League season ends. Many of us buy this product to get the cards signed, and it stinks waiting an entire offseason to get them inked. Terrible check list. No Eloy or Vlad autos? 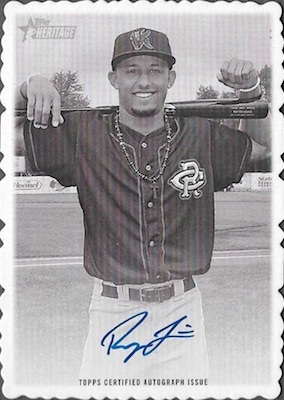 Pro Debut was one of the best products of 2018 and was looking forward to 2018 Heritage Minor League, but this may be one of the worst products Topps has ever released in terms of autos. Yes this is a set builder product, but this could have been a home run product with just a few autos of the better prospects. Not sure I can find a single auto worth more than $10 on the checklist. Very disappointed in the autograph checklist. I agree with others- Boring autograph checklist. I’m glad the Tigers are well represented this year and Alex Faedo gets a card, but was shocked Jake Rogers- the best defensive catcher in MiLB- was snubbed yet again. And I wish Topps would do away with the two year old league leaders cards… The 2018 season just ended- No one cares about the 2017 statistical leaders. 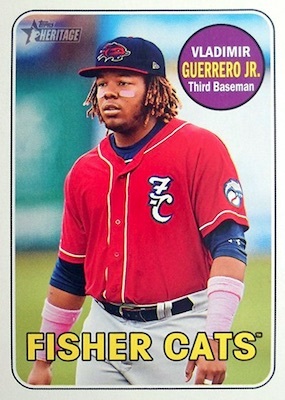 Would rather have 200 different prospects make up the base set. Still buying to get the cards signed next year, but sort of a boring release. 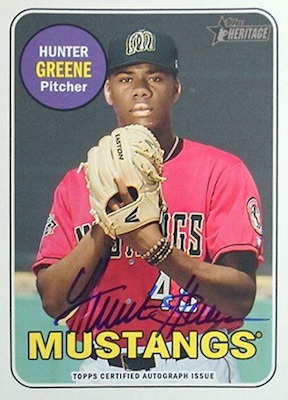 I realize I’m probably in the minority here, but I collect cards of my local MiLB team. I’m not interested in seeing top prospects or finding ultra-low numbered relics or autographs for investment purposes. I want to see my city’s team represented. This year’s offering is satisfying with a couple of base cards, a league leader, a deckle edge, and a relic. The design is great, too. 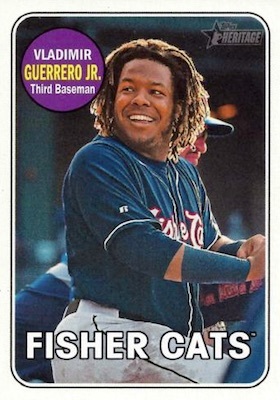 I wish Topps sought to have at least one card from every Class A+ and up team, but I realize why they pick who they pick. Funny thing is, we all know the guys whoopin’ it up already, or the “highly-touted” prospects. I did the same thing: said “who the poo?”, squawked, and said “screw it.” So, if this site’s still up-and-running in 2023, don’t be shocked if these comments are being read and laughed at. May not end up being the best prospect checklist, but there’s always guys nobody had on their “Top-whatever” lists…. Here is a set with a easy going price point. Easy to build. And the same stock used for Heritage (MLB) and High Number. We’re not talking some flimsy stock usually reserved Opening Day. For $50-some bucks you get to have some fun. No skunk (aka Heritage “Thanks for the $125 bucks. Here’s your napkin relic, a-gain!”). You’re guaranteed an auto. There’s some fun stuff in there. Coin cards and such. And who knows, you could wind up sitting on the next Mike Trout… maybe. Sorta. It’s just fun. I dig these. You don’t have to love them. I just dig them. I dig it. Accept it for what it is, I do… it’s quirky fun. 5 out of 5 for these. This is my favorite set of the year! I collect these to get them signed so I wish they came out a little earlier in the season. No real complaints but I think they should make a relic sub set of Futures Game relics. Bowman draft used to have them but they went away for some reason. 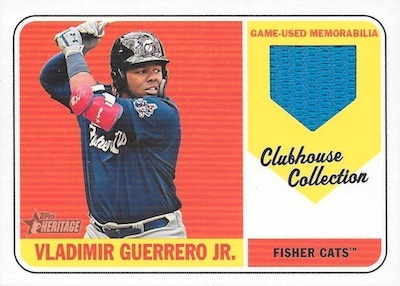 Many of the relics in this set are futures game jersey cards, why not promote that fact? The players are pictured in their minor league uniforms but the jersey pieces are either orange (team usa) or blue (world team). They should at least picture them in the FG uniforms on those cards. Love ’em. 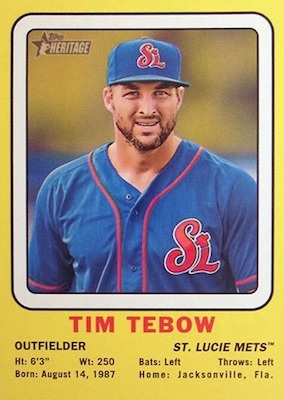 I just wish they were easier to find and the set was larger – lots of minor leaguers to choose from. I got one oddity in a pack – #195, Batting Leaders Longo, Miller, and Hiura, with a gold 03/25 stamp – except it is exactly the same in every way as two other copies of the card without the stamp. Am I missing something? Base versions #/25 are supposed to be the Team Color Change parallels but it seems that nothing was actually changed for the League Leaders subset but the added stamped print run. I’m with all the others a better auto selection would of made this product great. Luckily I pulled a dual of Keibert Ruiz/Jeren Kendall /20 so I can’t complain. A few better autos and maybe a more exciting insert other than that ugly yellow one.